Got strawberries? 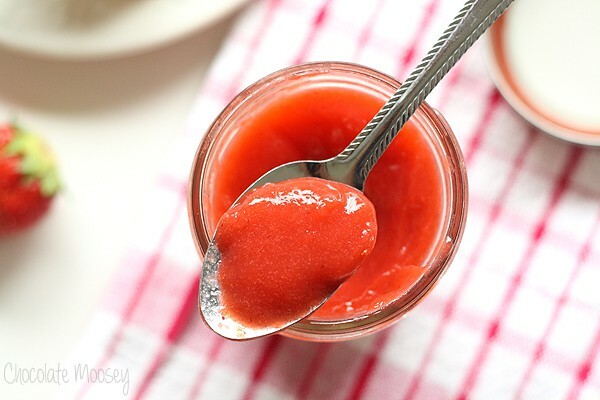 This super quick Strawberry Sauce can be ready in minutes and makes a great topping for pancakes, waffles, ice cream, and so much more. I’m totally not a breakfast person. Since I work during the week, I grab something quick like a bagel or oatmeal. 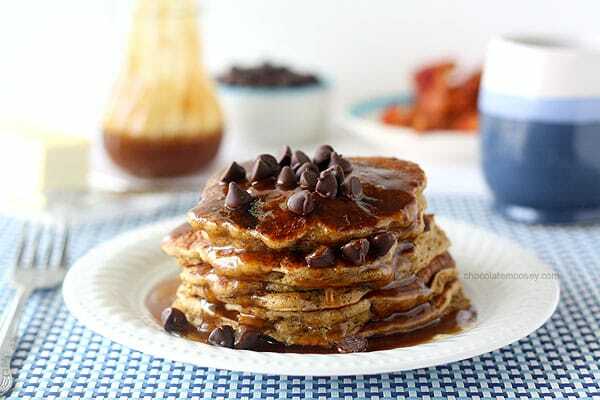 On the weekends I do take some time to make hashbrowns or pancakes but nothing fancy. On vacation I have trouble finding something to eat at the continental hotel breakfasts. And when I do eat at a restaurant, I tend to order the same breakfast – two eggs over easy with hashbrowns and bacon, mainly because that’s the only thing I’ll eat on the menu (although one time I did get country-fried steak. That was artery-clogging good). However, when I visit my parents for the weekend, I often request chocolate chip waffles with strawberries on top. 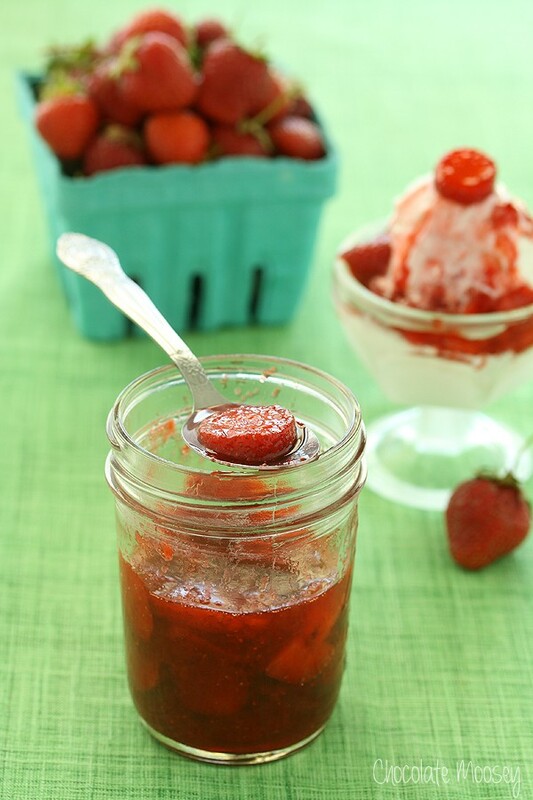 For as long as I can remember, we used frozen strawberries in a tub (thawed, of course) to top pancakes, waffles, and French toast, but when there are fresh strawberries in the house, I like to make this super quick Strawberry Sauce. Ready in 5-10 minutes, this easy sauce makes a great topping for waffles, pancakes, ice cream, and anything else you can imagine. Just slice the strawberries and cook in a saucepan. Breakfast at my parents just isn’t the same without strawberries. A few times Dad has even gone out the night before just so we would have them the next morning. 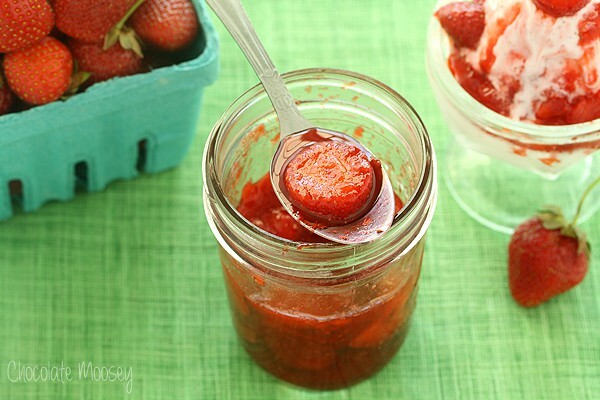 When they visit me and if I have fresh strawberries in the fridge (usually in June), I’ll whip up this sauce for them. Mainly because I don’t buy syrup, so they literally have nothing to top their breakfast with except for butter. One time Dad managed to drop butter into my tote bag on the floor. Don’t even ask how that is possible. I think the best way to serve this sauce (besides breakfast) is on top of ice cream. 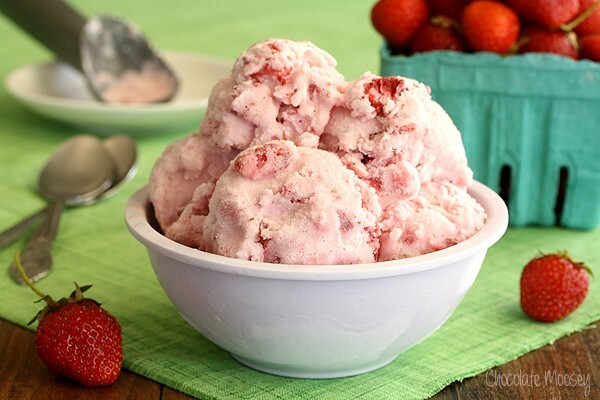 My favorite way is on top of vanilla bean ice cream, but a big bowl of strawberries and cream ice cream would be even better. 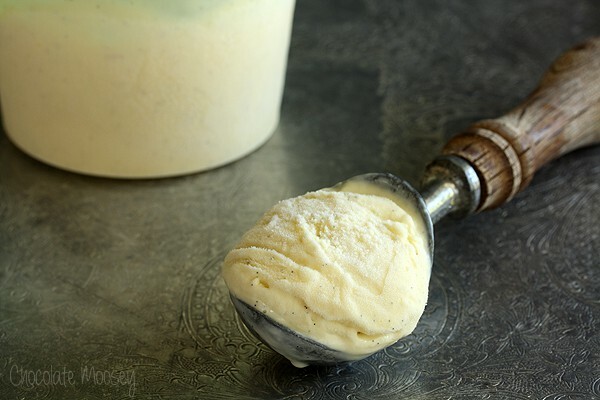 Or even strawberry lemonade ice cream. 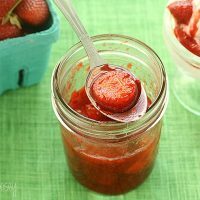 This strawberry sauce is so versatile, you can use pretty much any juicy fruit – strawberries, raspberries, cherries, peaches. 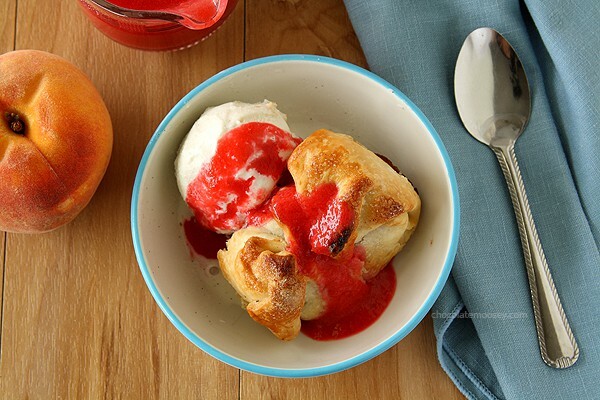 I tend to make strawberry the most because that’s what I’ve always had for breakfast, but one summer I won half a bushel of peaches, so I made lots of peach sauce too. 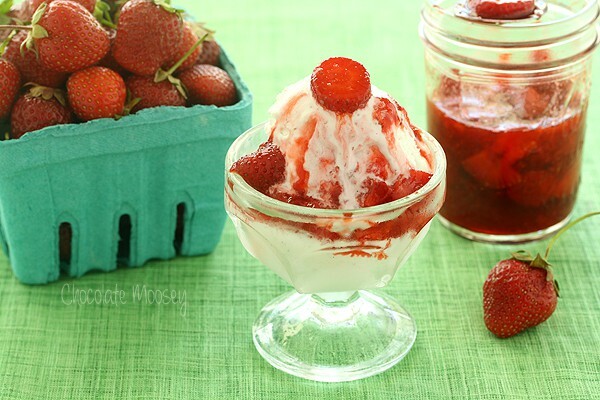 Serve Strawberry Sauce on top of pancakes, waffles, French toast, ice cream, and more. 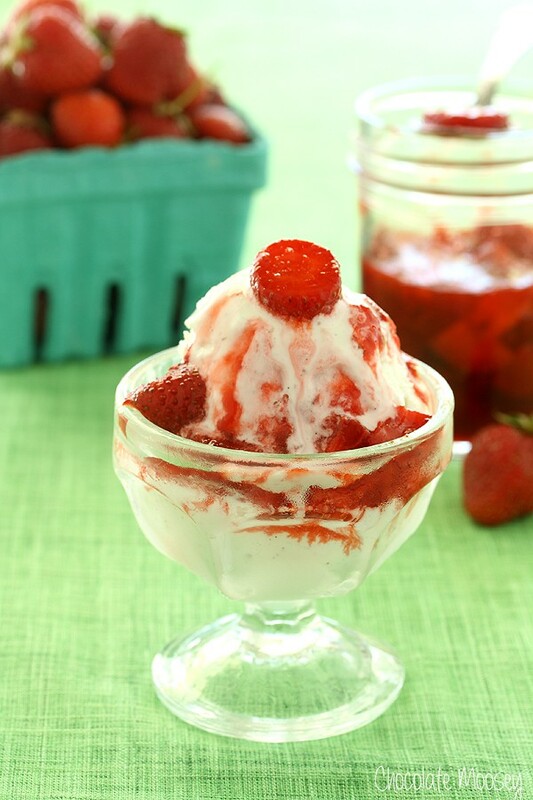 In a medium saucepan, bring 1/2 cup sliced strawberries, sugar, and lemon juice to a boil. Boil for 3 minutes or until the strawberries are cooked down and the mixture thickens. Remove from the heat and stir in the vanilla and remaining strawberries. Serve immediately. Store any leftovers in the fridge for up to two weeks. Want more? You won’t be able to resist these favorites! this is wonderful for so many things! This looks absolutely perfect! I want to go whip up a batch of pancakes so I can drown them in this sauce. I could see using this wonderful strawberry sauce on a LOT of things, Carla. What a beautiful color it is! The sauce looks so good, I would love to can it and have it all year long. 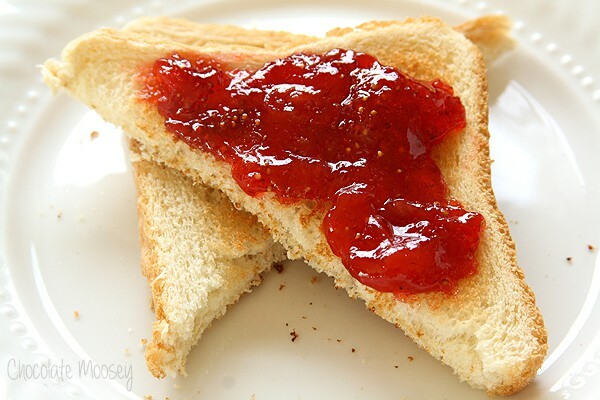 Your pictures show it in a canning jar. Does that mean you do can this sauce too? If so, I would love to have some canning directions for it. Like, water bath canning? How to prepare it for canning, if different than preparation for fresh use. How long to boil the jars in the water bath canner? Thank you. The jar is partly because of presentation and partly because I store my homemade sauces in mason jars in the fridge uncanned. I’m not a canning expert and do not want to steer you in the wrong direction since incorrect canning could be harmful. I highly recommend reading up on canning and decide whether this recipe would be safe.